Pigment PY74 is one of the most commercially important pigments of the Hansa Yellow group, considered superior to many others in its class based on both tinting strength and lightfastness. Several PY74 grades with different particle sizes are available. Grades with finer particle size are more brilliant and transparent. Pigment PY74 ranges from reddish yellow to greenish yellow, with temperature shifts from cool to warm hues. It has high tinting strength and average to slow drying time. This Hansa Yellow has better lightfastness that other yellow monoazo pigments, particularly in the darker shades. Arylide, Arylide Yellow, Azo, Brilliant Yellow, Monoazo, Monolite Yellow, Permanent Yellow. 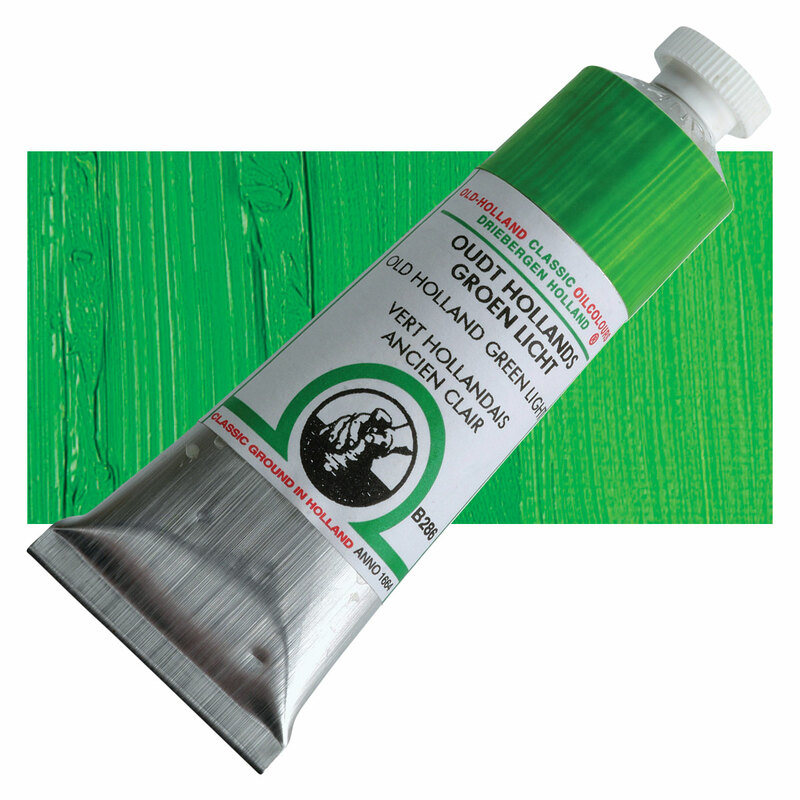 Phthalo Green is a transparent, cool, bright, high intensity color used in oil and acrylics. It comes from a Phthalocyanine Blue pigment where most of the hydrogen atoms have been replaced with chlorine, forming highly stable molecules. Pigment PG36 differs from PG7 in that a portion of the chlorine atoms are replaced with bromine atoms, which are reactively similar, but cause a yellow shift that is especially noticeable in mixtures. Phthalo Green has similar pigment properties and permanence to Phthalo Blue. It is slow drying and an excellent base color for mixing a range of bright greens. Phthalo Green is considered a very good alternative to Viridian because it is intense and mixes well and can be used to emphasize mineral colors in various tints. However, its tinting strength is very high, so it can overpower other colors. This pigment most closely resembles the discontinued and toxic Verdigris. ® Old Holland is a registered trademark.